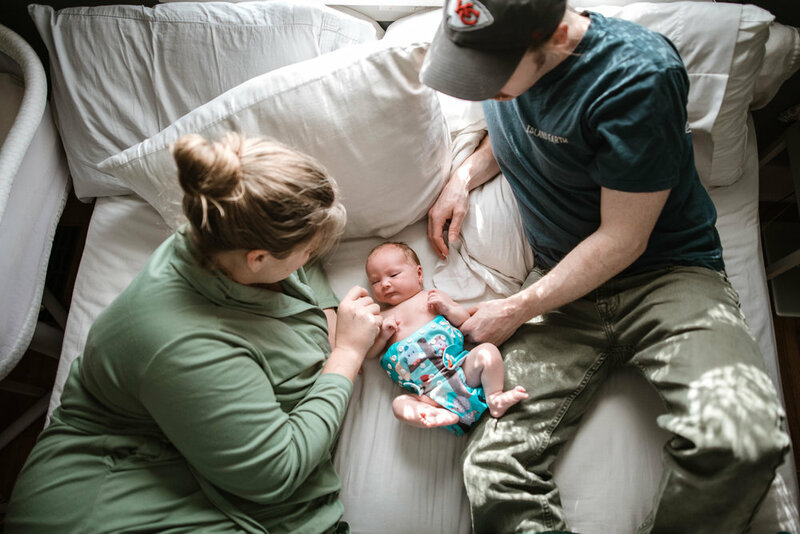 The quiet and warmth of those first days with your newborn—there’s truly nothing like it. The outside air was chilly and overcast, but when I walked into Emilee and Warren’s space, I immediately fell in love with the natural light coming in through the windows and with the stillness in their home, which is such a break from the harshness of the Midwest Winter. Baby Nova was in her cloth diaper, snuggling perfectly with Mama. Emilee began nursing Nova, and we chatted while I documented the moments between them. The holding of her tiny feet, trying to take mental pictures of every detail, wiping her eyes of the newborn eye goop (one of the little things you forget until you have a newborn again! ), and of course taking in how much hair she has! 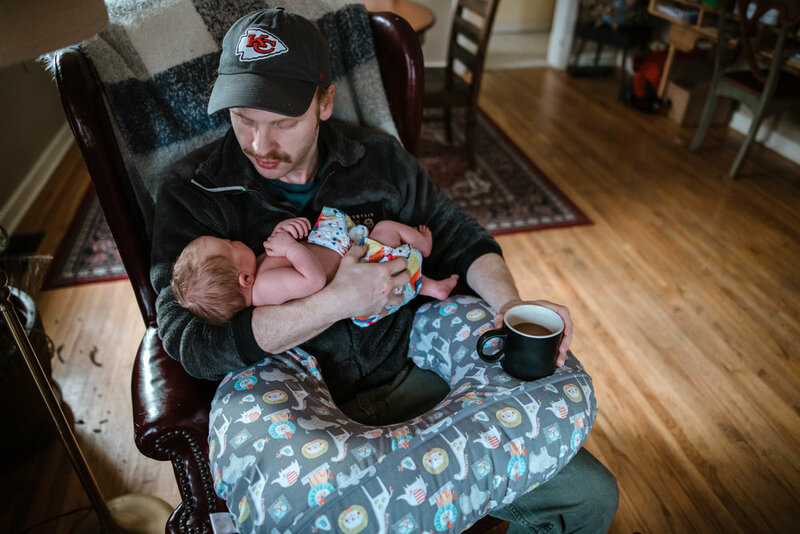 Warren began cooking them breakfast—nothing better than bacon to make a house smell like Saturday—and then came and snuggled his daughter while Emilee got a break to eat. Some of my favorite moments between them are from their cozy bedroom where they rested together and admired their new baby. The bonding was tangible. The light was trickling in through their lace curtains, warming the room. It was perfect. Eventually we made our way back to the living room by their big dining area window. I couldn’t let the morning finish without capturing the radiance of that light coming in. I also wanted to document them from afar. Snuggly images are some of my favorite to capture, but I’ve learned the storytelling power of stepping back. No matter the scenario, I feel it always portrays the full picture. This family is off to a beautiful start together, and I’m so honored to have documented glimpses of their beautiful season.